Governor Rudd’s Proclamation to The Aborigines reappropriates Governor Davey’s Proclamation of 1816. Appearing throughout Tasmania, the placards illustrated Lieutenant-Governor George Arthur’s policies of conciliation and equality. A futile attempt to halt cyclical occurrences of cultural misinterpretation and vengeful provocation, relations between Europeans and Indigenous peoples deteriorated into what is now known as the Black War. 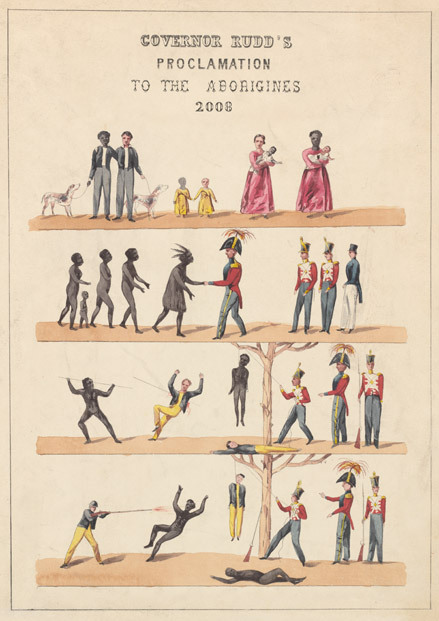 Mass killings of Tasmanian Aboriginals followed Arthur’s declaration of martial law in 1828, the last of which, following introduced diseases, incarceration, and systematic annihilation, perished in 1876. Governor Rudd illustrates the disparity between decree and action, atonement and cultural apathy, tokenism and ultimate resolution, particularly following 2008’s apology. A peripatetic with an insatiate lust for anthropological curiosities, the obscure & the peripheral, Kingston Trinder is a Copywriter & Journalist. He delights in scrutinising the minutiae of cultures, the intricacies of our existences, & attempting the articulation of these all too complex things. Or so he likes to think. A recipient of the Young Entrepreneur Award from the Scottish Executive, he was further awarded a Fellowship with Fabrica, United Colors of Benetton’s Communications Research Centre in Italy. Here he was a Journalist with COLORS Magazine, Benetton’s photojournalism quarterly. He’s also a Leo, has a penchant for aquiline noses, & does indeed like getting caught in the rain.